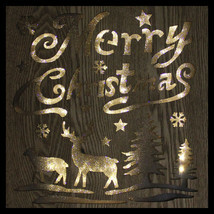 Hang this wall decoration to boast your Christmas wishes to all your friends and family when they visit. Natural wood design blends with any holiday decor. Pre-lit behind a glittering insert helps to silhouette the cut out designs. Makes a great gift for a cherished friend or loved one. 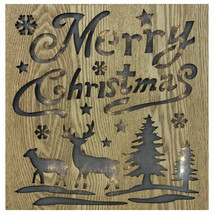 Features a wooden plaque with the words "Merry Christmas" cut out Includes cut outs of reindeer, trees, stars and snowflakes Back lit with warm white lights that give a candlelight glow through the cut out designs Convenient on/off switch on side Attached alligator clip for easy hanging Requires (2) "AA" batteries - not included Recommended for indoor use only Dimensions: 12"H x 12"W x 1.5"D Material(s): wood/plastic/metal Powered by Frooition All Categories All Items See our store for more great items Shop Categories All Categories 12" Lighted Wooden "Merry Christmas" Christmas Wall Decoration Item Description Hang this wall decoration to boast your Christmas wishes to all your friends and family when they visit. Natural wood design blends with any holiday decor. Pre-lit behind a glittering insert helps to silhouette the cut out designs. Makes a great gift for a cherished friend or loved one. 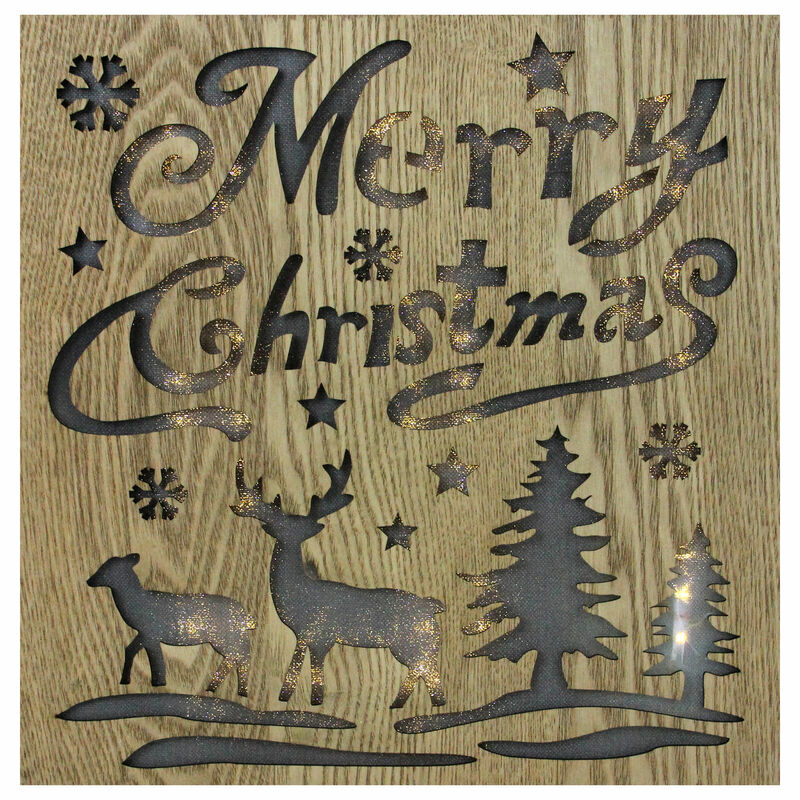 Features a wooden plaque with the words "Merry Christmas" cut out Includes cut outs of reindeer, trees, stars and snowflakes Back lit with warm white lights that give a candlelight glow through the cut out designs Convenient on/off switch on side Attached alligator clip for easy hanging Requires (2) "AA" batteries - not included Recommended for indoor use only Dimensions: 12"H x 12"W x 1.5"D Material(s): wood/plastic/metal About Us About Us Payment Shipping Terms Returns About Us Christmas Central provides one of the largest online selections of Christmas decorations, home decor and outdoor living items. Our shelves are stocked 365 days per year, and products are shipped from our Buffalo, NY, warehouse in less than two days from your purchase. We offer everything from the smallest ornament to the tallest artificial Christmas tree and everything in between. But we are more than just Christmas! We offer all holiday decorations in addition to indoor and outdoor decor and everything you need to decorate your home. As a division of the family-owned and operated Gordon Companies Inc, we have 40 years of experience as a retailer. Payment Payment We accept Paypal, Mastercard, Visa, American Express, and Discover cards If you have purchased multiple items from us using the buy it now, or are bidding multiple auctions, please wait for all of them to close (within 7 days only) and proceed to checkout where your purchases will be combined. NOTE FOR COMBINED SHIPPING: Please be sure all items are selected before proceeding through the checkout. If all items are not selected, combined shipping will not apply. Christmas Central is not responsible if you do not select all the items in your cart. 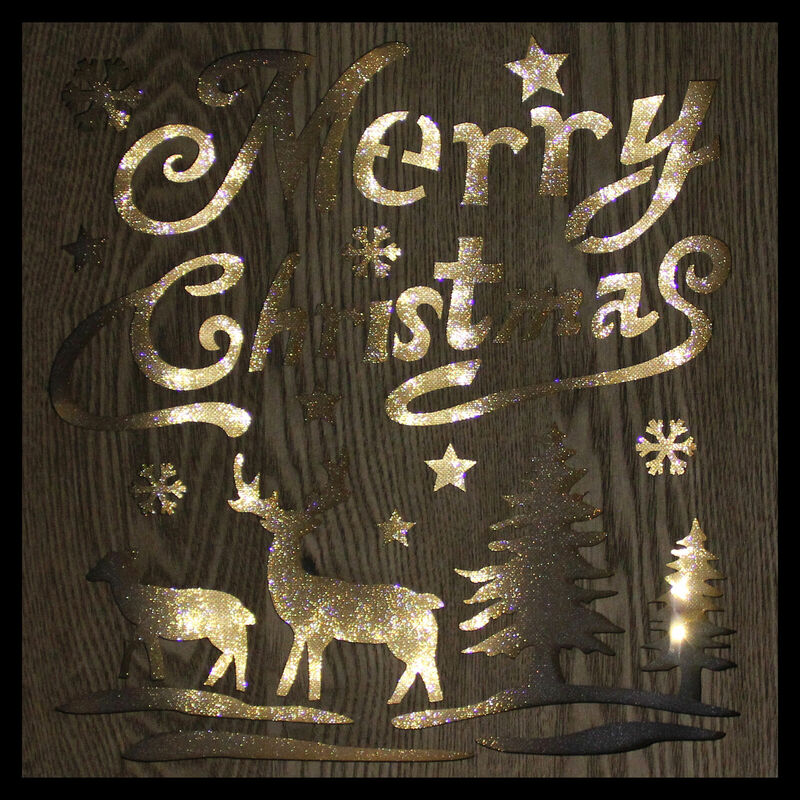 Shipping Shipping FREE GROUND SHIPPING on all eligible items from ChristmasCentral Ground packages will be processed and shipped approximately two business days after payment is received. We cannot guarantee an exact date of delivery for ground shipments. We ship via UPS, UPS Mail Innovations, UPS SurePost, and USPS. REQUESTS TO ALTER DELIVERIES: Christmas Central cannot change shipping addresses, schedule a delivery time, give delivery instructions, or hold for a different delivery date for any package shipped. However, you do have the option to sign up for one of the following carrier programs: For packages shipped via UPS: UPS offers shipping changes to be made through its My Choice program if a package is not already "out for delivery" For packages shipped via USPS: USPS offers shipping changes to be made through its Package Intercept program if a package is not already "out for delivery" Item location: Buffalo, New York, United States Shipping to: United States Excludes shipments to: PO Boxes, Alaska/Hawaii, US Protectorates, Africa, Asia, Central America and Caribbean, Europe, Middle East, North America, Oceania, Southeast Asia, and South America Unfortunately, we cannot ship any order to an APO or FPO address. Any order being shipped to one will be canceled. Terms Terms THIRD PARTIES We will not disclose your personal information to any third party, except to the extent necessary to provide you with a requested service (i.e. shipping your product to you) or under circumstances required by law. PRICING Prices listed online for all Christmas Central listings , our direct website or other marketplaces are subject to change at any time. TAXES Seller charges sales tax for items shipped to: NY*(8.75%). *Tax applies to subtotal S H for these states only Returns Returns Can I cancel my order? Unfortunately once an order is placed we cannot cancel the order. Once you receive your order you are more than welcome to return it, but our standard return policy will apply. Can I return my order? If you change your mind about a purchase or no longer need the merchandise, you can return it to us for store credit or a refund provided that: We receive the returned merchandise within 30 days of receipt, or before December 25th (whichever comes first) AND Merchandise must be in unused condition including all hardware, instructions, any accessories that may have come with the item and is in its original packaging. Who pays for return shipping? Unless we made an error, you will be responsible for shipping your order back to us. You can ship back via the carrier of your choice. Please be sure to use a traceable method to ensure a safe and documented delivery. If you opt for store credit instead of a refund, Christmas Central will email you a pre-paid return shipping label. If you?re in need of a label please contact a Christmas Central representative. You will be responsible for printing out the label and taking the package to a UPS drop off location. Note: Free return shipping is only available to the lower 48 states How does store credit work? Once your return has been processed our returns department will email you your store credit code. The code will be for the full value of the merchandise returned; you can then use the code to place a new order. Where do I ship returns? Please contact us for the address to our Returns Center Do I need an RMA#? Christmas Central does not use RMA#?s Do I have to include any paper work with my return? Include a copy of your invoice with your email address How long until I receive my store credit or refund? Generally return processing takes 2-3 weeks, during peak holiday season it may take longer. Can I exchange my order? To exchange an order please follow the return instructions above, Christmas Central will send you a store credit that you can use to place a new order. What if there is a problem with my order? Please promptly inspect items upon receipt. If there is a problem you must contact us within 7 days of receiving your order. We will gladly troubleshoot the problem for you and find the best solution for the issue. If your item arrives damaged please email us your order number, details, and photos documenting the damage so that we can expedite a resolution for you. We will contact you with instructions once we review your information. Please do not send damaged, defective or wrong merchandise back to us unless instructed to do so by a Christmas Central representative. Non-Returnable Items Unless we made a mistake in your order the following items are non-returnable under any circumstances: Giant Everest trees Grand Teton trees Food items Patio furniture sets Life-Size nativities Clothing Shoes Helpful Links Add to Favorite Sellers Sign up to Newsletter View Feedback Contact Seller Visit seller's Shop About Seller Page More Items! View more great items! Powered by Frooition Frooition No-js Template design, store design, shop design, template design, listing design (ver:froo_no_js) This listing is currently undergoing maintenance, we apologise for any inconvenience caused.